Bratislava, Slovakia, July 1, 2015 - The FIVB Volleyball World League Group 3 Final Four tournament will be held at the AEGON Arena in Bratislava on July 4-5 and features Egypt, China, Montenegro and hosts Slovakia, in one of the biggest volleyball events in the history of this young nation. “The Final Four is a very important competition and we wanted to bring this kind of competition back to the capital city,” said Slovak Federation president Lubor Halanda. “We are proud to be among the best teams in the world.” Two years ago, the Slovakian national team played an exhibition game against Russia at the AEGON Arena. The match was a big success and the sold-out crowd witnessed great volleyball. The success of the exhibition match served as an inspiration to host the World League Group 3 Final Four and to make the Slovakian team a regular participant in the premier annual competition for men’s national teams. The team is full of stars who play at top international clubs. Kmet recently won the bronze medal with Berlin Recycling Volleys in the CEV European Champions League. Michael Masny is a key player at top Polish club Jastrzebskie Wegiel. And the Slovakian national team have also achieved notable successes: they won the European League in 2008 and 2011, and finished third in 2007 and 2014. At the 2011 European Championship, the team finished fifth. They have also qualified for the European Championship this October. However, since the break-up of Czechoslovakia in 1993, Slovakia have not competed at the World Championships or Olympic Games. Czechoslovakia were one of the most successful nations in the history of international volleyball. World champions twice, European champions on three occasions, silver and bronze winners at the Olympic Games: the sport is steeped in tradition from the Czech capital Prague to the Slovakian metropolis Bratislava. 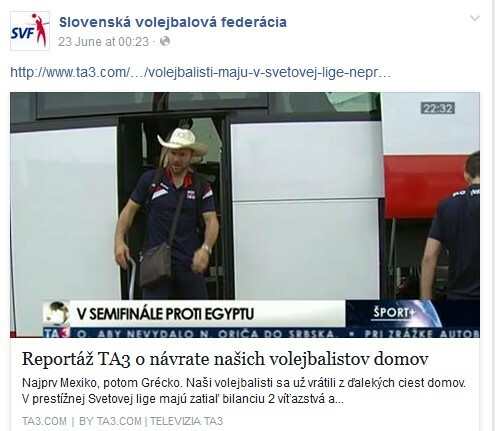 A new story will be written when the Slovakian team take on Egypt in the semifinals. Slovakia are relying on the support of their fans. And on the coach Flavio Gulinelli's experience. Gulinelli was assistant coach for Italy from 1997 to 1999, helping the team to win the gold medal at the 1997 World League and 1998 World Championships. Gulinelli also spent time with the coaching staff of the Brazilian men's team from 2002 to 2004. He has coached club teams in Italy, Greece, Russia and Turkey. Gulinelli: "I want to thank the national federation for making such a big effort to organise the Final Four in Bratislava. We are hoping to return the favour with a good performance."